Are you an island addict? If so, this is the trip for you! Visit 10 islands in 6 days, walk some of Scotland's finest routes and enjoy breathtaking seascapes, wildlife and archaeology. Our flagship holiday is the ideal tour if you love Scottish islands - visit 10 islands in 6 days and walk some of the finest routes in Scotland! A great way to experience the magic of the Outer Hebrides, this gentle journey down the entire length of the island chain offers unrivalled variety, interest and scenic beauty. Over the course of the week you will visit wonderful Lewis beaches, remote mountain glens in Harris, see the stunning flowering machair of the Uists and experience the unique charms of the smaller southern Hebridean islands of Eriskay, Barra and Vatersay. We will be travelling at a relaxed pace, with a mixture of longer and shorter days. As well as enjoying great walks we will take time to experience some of the fabulous wildlife the islands have to offer (the Uists, for example, are the best place in Britain for the elusive corncrakes). You will also experience some tremendous archaeology, including Lewis's two spectacular ancient monuments: Callanish Stones and Carloway Broch. Staying at selected B&Bs for two nights each on three different islands, our Outer Hebrides Highlights holiday is the perfect introduction to these fascinating islands. Be warned, these islands are very addictive - like many of our previous clients, if you come on this trip you will probably find yourself coming back for more! This wonderful and varied low level hike is one of the best in Scotland. Starting at the beautiful machair of Huisinish, we will visit the stunning beach of Traigh Mheillin, which provides unparalleled views out to the nearby island of Scarp. From here we will explore the beautiful Glen Cravadale, before returning back to our start point. After the walk we will drive to Leverburgh and take the ferry to Berneray. This takes an hour and on a fine day must be rank as one of the most beautiful ferry journeys in the world! www.flybe.com - Manchester, Birmingham, Belfast, Jersey. What's Included: 6 nights accommodation, 5 days walking. Accommodation at local quality guest houses*, with full Scottish or continental breakfasts; packed lunches; evening meals at local restaurants (note that lunch on the final day is not included). ​All transport during the holiday, including collection and drop off in Inverness and all ferry crossings. The services of an experienced walk leader. Transport is provided by our comfortable, modern minibus. On transfer days luggage is left in the minibus whilst we go for walks; whilst walking you will only need to bring a small daysack in which to carry your packed lunch, waterproofs, etc. *This holiday involves staying in three separate guest houses (two nights in each). We start off with two nights in or near Stornoway on the Isle of Lewis, the bustling little capital of the Outer Hebrides. We follow this with two nights in North Uist and end with a further two nights in Barra. Easy / Moderate. (This is a slightly easier holiday than our other Outer Hebridean trips but we would still class it as Easy / Moderate grade). ​These holidays go at a gentle pace, with plenty of time to stop, take pictures, soak up the atmosphere and watch the wildlife. However, they are still walking holidays, so you will need to be able to cope with a reasonable amount of hiking each day. As a guide, you should be able to manage small uphill sections, be comfortable walking for 4 - 5 hours and 6 - 7 miles or so each day, and be confident walking away from paths - for example over rough, grassy hillsides. The following reviews are taken from the Hidden Hebrides page on TripAdvisor: Too see reviews of all our holidays click here. This tour starting north, on the Isle of Lewis, and traveling south to Barra, the southernmost island, over 7 days, included lots of walking, endless and mostly empty beaches, learning about the history and archeology of the outer Hebrides, eating lots of delicious food (especially seafood) and staying in lovely B&Bs. We had exceptional weather for walking in these beautiful islands and left most of our warm and waterproof clothing in our bags, though I used rather more sunscreen than I expected to. Seeing the range of landscapes on the islands, the archeological sites and the glorious beaches (complete with otter!) far exceeded our expectations. John did a great job of guiding and of balancing the needs of our somewhat quirky group of 8 friends. We also appreciated the behind the scenes work of Mick and his team that made everything appear seamlessly organized. It was an outstanding experience and we are already planning our next trip with the company for 2020. So grateful my friends convinced me to go on this trip. I have already started contemplating on returning to this magical area. The knowledge and expertise of our guides, Mick and Eilidh were "spot on" in explaining any and all of our questions regarding landscape, birds, flowers etc. The beauty and vastness of the land, the culture, the people, the food made this trip so enjoyable. My friends and I were joined with five other women, who we bonded with almost instantly. I have no doubt that our alignment with these women was meant to be. Did I mention that we all love to sing? Where do I start in explaining our guide Eilidh, who was not only knowledgeable of the land and able to answer any and all of our questions, but empathetic and compassionate to each individual's needs. Thank you Eilidh for your friendship. Looking forward to returning. This was a wonderful experience with Hidden Hebrides guide Eilidh McCleod. Eilidh was kind, attentive, knowledgeable, and so much fun. Born and raised on Lewis, she knew the history, animals, and plants of the islands, and led us through unbelievably beautiful and unspoiled landscapes and beaches. She was sensitive and understanding of individual needs and interests. Our accommodations were outstanding. We stayed at B&Bs and were welcomed with kindness and great food. We had dinner at local restaurants and the food was delicious! Still thinking about the fried duck and crab salad! My 7 traveling companions were flexible, so interesting, and fun. We quickly became friends. I miss them and Scotland already! Would love to take another trip with Hidden Hebrides! I was on a small group walking tour with 8 women and the best guide in the world Eilidh MacLeod. I learned so much about the Outer Hebrides and had a fun time. Eilidh knew information about the flowers, animals, beaches, walking paths etc. The scenery was exceptional and I was surprised how much planning went into our gourmet meals. We ate at so many fabulous restaurants/ Everything was "spot on....and well done" as they say in Scotland. I highly recommend this tour company. Mick Blunt, the owner was great, answered all of my questions before I departed for Scotland. The price was reasonable for all that was included. I can't say enough to describe the efficiency, kindness and humor provided by Hidden Hebrides Tours. Just back to France from a week in the Outer Hebrides. We were a group of 6 with John our guide (2 French and 2 British women, 1 Belgian man). The group matched at once and we had fun. Everything was perfect : the scenery, the walks, the food, the B&B's under the guidance of John (also our driver). A lot of wind, little rain, We just had to keep our eyes wide open (and watch our feet!) and enjoy. Thank you to Mick and John for their knowledge of the islands and their concern to make our stay as nice as possible! We recommend it! A wonderful week with guide John Groom. Best beaches, wildlife, flora and fauna, history, breathtaking views around every corner and John's knowledge of the history and hidden places made the walking holiday perfect. Military precision and perfect planning meant everything​ ran to plan- thanks Mick. Choice of B&Bs of a very high standard by Mick and John's favourite eating places made the holiday very special. Already thinking about 2018! Would not hesitate to book again. 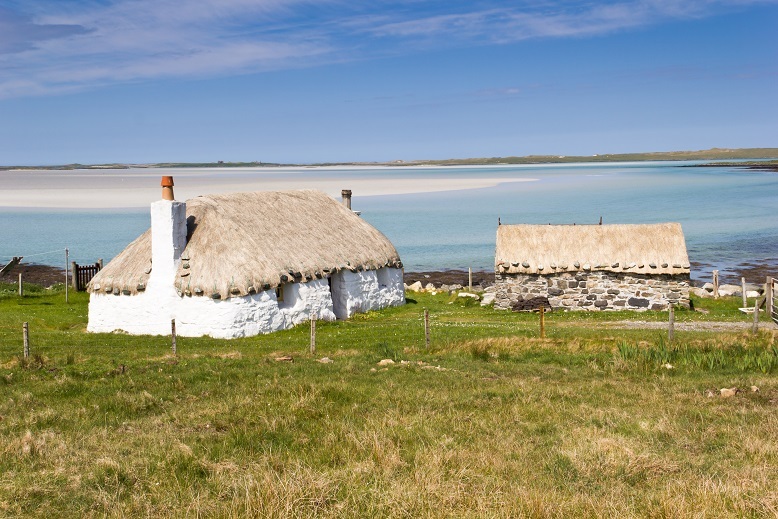 This walking holiday which incorporated visiting most of the inhabited islands of the Outer Hebrides including Lewis, Harris, North Uist, South Uist and Barra was a great introduction to the life and culture of these amazing islands. I take my hat off to Mick, our guide who had an in depth knowledge of the islands through having lived and worked there for a number of years . Mick led us on some fantastic hillside coastal walks to areas we would never have dreamed of going ourselves as they were only accessible by foot. We had a well balanced and friendly group of 8 lovely people from different nationalities and all walks of life all of whom wanted to obtain a bird's eye perspective of the islands. I was even able to do a bit of research on some of my ancestors who came from here. I would certainly recommend this type of holiday to people who want an activity holiday which will enable them to learn a lot about its culture, history, wildlife and fauna. I'm now planning my next holiday with Hidden Hebrides next year! Fresh areas (a new island visit every day), fresh food (a different restaurant with fresh food every evening), fresh outlook (Mick has so much knowledge of wildlife, rock strata, history, fauna..), fresh air (those ferries booked for us every day! to a different island of the Orkneys), fresh sites (neolithic to Viking history Mick gave us an original view). An excellent group holiday with 8 people from all over England with every aspect covered! I have just returned from this holiday and absolutely could not fault it. From picking us up at Stornaway airport to leaving us to fly from Barra beach a week later, the organisation was superb. Mick is a wonderful guide - passionate about his beautiful islands, extremely knowledgable about their history, flora & fauna, a safe driver and a thoroughly nice person. The B&Bs were comfortable and the hearty breakfasts memorable! Rarely have I enjoyed a holiday more. I can strongly recommend it. We were a group of eight from all over the UK. We had a wonderful time in amazing scenery and true Highland/Island hospitality. Guest houses, food, walks and Mick's love of the islands came through every day. His wealth of knowledge of the history, flora and fauna was just lovely. I learned a great deal and had wonderful walks covering eleven islands in all. Although I am Scottish and Mick English, he knew far more about the history of the area than I do, plus every island, mountain, area, he knew. Outer Hebrides will see me next year hopefully. Mick Blunt is a passionate and extremely knowledgeable guide. In spite of some rain he made the week of walks from north to south of the Outer Hebrides an unforgettable experience. For me it has been a long-held dream to visit this spectacularly beautiful place - the week exceeded all my expectations. I cannot recommend highly enough this trip. This was a holiday company that was with me every step of the way excuse the pun from the deposit to being dropped back at the Premier Inn East in Inverness. The walks were beautiful without being too long or too short, the restaurants and the accommodation were to a very high standard without being posh and run by friendly people. John Groom, the guide was also friendly, unflappable and a gentleman without being intrusive on the group. I made good friends on this holiday and now have friends and acquaintances who want to visit the Outer Hebrides.